The lovely young woman on the left is (I believe) Emma Hamilton, who began life as Amy Lyon. She was the daughter of a blacksmith but she had big dreams. Dreams of wealth and prosperity. Emma moved to London, centre of wealth in England and upward mobility. She became a ladies maid to survive, then mistress to wealthy gentlemen. One of these men introduced her to the painter George Romney. Romney became obsessed with Emma. He painted Emma more than 50 times, portraying her as heroic historical figures like Joan d’Arc or Cassandra, Princess of Troy. Her beauty was captivating. Her love of life overwhelmed men. They succumbed to her femininely whiles. She eventually married Sir William Hamilton, her elder by some 34 years. Through her husband (He was ambassador to Naples.) she met Horatio Nelson and began a torrid affair with him. Though they wanted to marry, divorce was not an acceptable route to take for it would have brought shame on Sir William as well as it might even effect Horatio’s naval career. They waited, they lived together, and eventually Sir William died. Now Nelson could divorce his wife and marry Emma, but Horatio returned to the sea to battle the Franco-Spanish fleet. Nelson’s fleet won the seas but Horatio was fatally wounded and died before seeing Emma again. Emma’s life went into a tail-spin and she died in poverty and sickness in France after fleeing her creditors. From poverty to riches and back again. 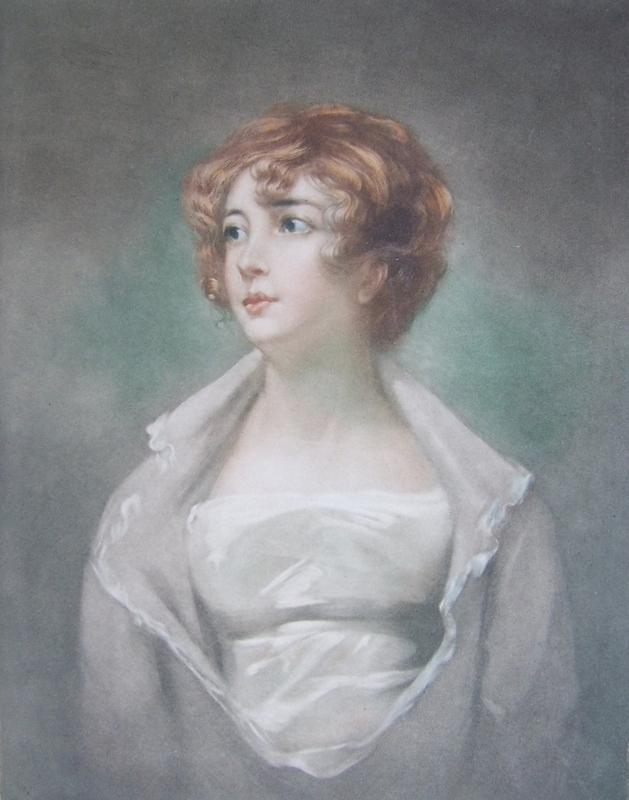 The lithographic portrait of Lady Hamilton was done by Lionel Ewart. It is embossed ‘Limited Edition Proof’. In very fine print across the top it reads ‘Copyright Published Feb 1916 by Landeker & Brown Ltd. London E. C. A beautiful portrait for a woman of mesmerizing beauty. Could her face launch a thousand ships as is said of Helen of Troy. Surely Horatio Nelson thought so, but his dying request that his beloved be cared for by the state went unheeded. I find the subtle colours used, the shades of green, the brown of her hair, the innocence portrayed, the vulnerability suggested, all lead one to say ‘yes’ Emma Hamilton was a beautiful woman. But I love this striking picture for its’ superb artistry. The technique is sublime. The eye of the artist true. And the finished product – well what more need I say. This entry was posted in Lithographs and tagged Emma Hamilton, gown, horatio nelson, sir william hamilton. Bookmark the permalink. Thanks Ron that is a fascinating vignette about the lady in question, very interesting! A different take on life in the Austen era from the usual.